I think every guitar student knows they should practice scales. Right? I mean it's like eating your vegetables. You know they're good for you. You know that scales are the building blocks of chords. You are also aware that the key to playing awesome guitar solos and improving your overall technique is knowing and practicing scales. But like eating vegetables most people don't do it as much as they should. Years ago I was the same way, but then I made the decision to just do whatever I had to do. To my surprise it wasn't really that bad. In fact now I know what was holding me back. I didn't know how to practice scales properly. Well... I fixed that, and my playing improved quickly. Now (like the good teacher that I am) I'm going to share with you the essence of what I’ve learned and use today. Here are 10 tips, or secrets if you like, to help you enjoy the benefits of practicing and playing your guitar scales. Practice Tip #1: Practice Your Scales Little Bit Every day. You cannot expect to be smooth and proficient at scales if you practice them just once in a while. Make them a regular part of your daily practice. If you’re just learning a particular scale take your time and get the notes and technique right. Then spend time practicing for speed and fluidity. Finally take time to regularly review all the guitar scales you know. Consistency pays off in the long run and makes it easier to play your scales without effort or incurring unnecessary tension. Practice Tip #2: Spend Quality Time Practicing Without Interruptions. At one stage in my younger days I would practice at the end of the day when I was tired, often while watching TV or even reading a book. That way I could say I practice my scales but avoided what I thought was a boring and tedious process. I realized over time that even though I didn’t forget my scales I also didn’t progress in either speed or fluidity. The key to improving is to make quality time to practice the guitar scales. Quality time means time practicing with your mind is still fresh and without interruptions or distractions. In this way you can pay attention to the nuances, correct mistakes, push through your speed barriers and even have fun with scales. Yes, playing scales can be fun! Especially when you relax and put your attention on what you’re doing. Make a game out of seeing how much you’ve improved over the week and what new things you can incorporate into your guitar practice sessions. Paying attention is the real message. That’s when the magic happens. Everyone wants to play passages of notes at blinding speeds. Believe it or not one of the most important principles of playing scales super fast is to first play them slow. By playing guitar scales slowly in the beginning you are making sure that you are training your muscles and your mind to play the notes accurately with the least amount of tension. You can’t do this effectively if you always work for speed. Take time to get the nuances right. Get your fingers in just the right place. Make sure your hand is in the proper position. Make each note with just the right amount of pressure, and no more. See if you can get your fingers or the pick in the right-hand to travel as small a distance as possible before coming back to the next note. Relax. When you feel tension creeping in stop and shake out your hands. Break the habit of tension before it becomes something you don’t even notice anymore. Then go right back into your practice. Work to get all the notes sounding clean, clear and at an even tempo. Practice Tip #4: Use The Least Amount Of Pressure Necessary. One of the keys to playing a series of notes quickly is to use the least amount of pressure necessary to make the notes sound good, and no more. Only press as hard as you need to to make the notes sound clear. Of course you do want to use enough pressure to make the note sound clean without buzzing. This is usually less pressure than you think. To practice this you need to practice slowly and see how much pressure you really need. Move from note to note and vary the amount of pressure to see what it actually takes to make the note sound. Back off until you hear the buzzing sound that means you need more pressure. Then apply just enough pressure to make this note sound clean. This type of practice does take patience and focus. It’s one good reason to make time to practice when you’re alert and without interruptions. Over time you will develop the habit of just using enough pressure. This will allow you to play faster and faster with less fatigue and more fun. Practice Tip #5: Spend Some Time Practicing Guitar Scales With A Metronome. 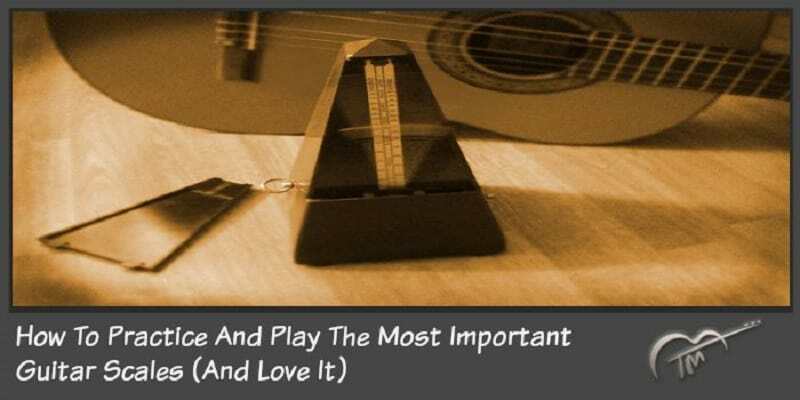 The metronome is a very useful device and it’s helpful to spend some time practicing your scales with the metronome. This will help you develop your timing and your rhythmic accuracy. Start by playing one note of the scale with each metronome beat. Go as slow as you need to to get the notes right and then pick up the metronome little by little. Then try practicing with two notes per beat. Move on to three notes per beat. The metronome is also a great way to measure your progress. I like to keep a chart and test myself with the metronome once a week. This way it becomes kind of a game and I look forward to seeing how much I’ve improved. See what kind of games you can make up using the metronome to make your practice sessions more interesting. While practicing with the metronome is helpful, it’s also important to practice without a metronome. You wouldn’t want to use the metronome when you’re learning a scale. Also it’s good to warm up without the metronome before practicing your scales. Finally it’s a good idea to just practice without the metronome to learn to depend on your own internal beat. Practice Tip #6: Practice Guitar Scales Up, Down, And From The Middle. Usually we play our scales starting from the lowest note and going all the way to the highest note. To really know the scale try practicing in different ways. Try practicing starting from the top note and going to the bottom now. Do this as quickly and accurately as you can. Then practice going all the way up and all the way back. Play the same thing again, but this time playing each note of the scale two times. Finally, practice your scale starting from different notes in the scale. This is important because when you actually play a musical passage you don’t really start from the root note of the scale. This will train your ears as well as your fingers to play starting on any note. Practice Tip #7: Use Dynamics. You can use your scale practice to also practice dynamics. This means playing softer and louder. Play the scale all the way through as softly as you can. Then go back and play it loudly. Try playing the scale with a combination of loud notes and soft notes. Practice gradual crescendos and diminuendos – starting softly, then building up to a loud point and coming back down. Initially it’s important to practice slowly and get the notes right, but you also want to make time to improve your speed. This means practicing scales in the way that you can play faster and faster. When I say faster I mean only as fast as you can play accurately with good articulation and technique. To do this make a game out of pushing yourself to play as fast as you can. When you reach the point where the scale isn’t accurate anymore back up and see where you can play it accurately. Try recording your speed and checking each week to see if you can break your record. One way to help improve your speed is to do speed bursts. To do this practice just three or four notes from the scale as quickly and accurately as you can. Then play three notes from another part of the scale. Finally try putting the two passages together and see if you can keep the same speed. When practicing for speed always warm-up first by practicing slowly and easily. Practice Tip #9: Play Your Scales With A Backing Track. Try playing your scale along with a recorded chord progression or “backing tracks” (also known as Play-Along or Jam Tracks). Use a progression in the key of the scale or one that at least sounds good with the scale. I recommend starting with fairly simple chord progressions of three or four chords. This is a great way to practice your timing with real music. You can also begin varying the notes to see what kind of musical phrases you can make up. After playing your scale with the backing tracks you can also use them to improvise by mixing up the notes and adding different licks. You can either create your own recording or purchase backing tracks. This is a lot of fun. Practice Tip #10: Keep It Fun And Interesting. There are many ways you can have a great variety in your guitar scale practice sessions to keep it interesting. I’ve covered many ideas in the previous tips for practicing guitar scales including playing faster, playing slowly, using dynamics, and playing with background tracks. It really helps me to make a game out of it and measure my progress as well as using the metronome. 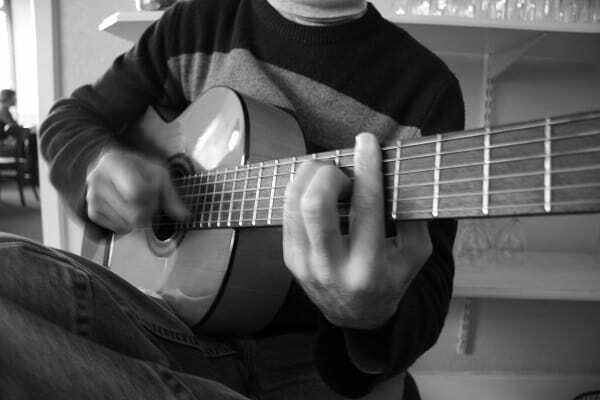 You can practice guitar scales both with a pick as well as with fingers (or picado as it’s called in Spanish guitar). Work separately on your right hand to play faster and more smoothly. I also want to encourage you to look for the pleasure in just playing what could be thought of as boring and monotonous scales. I realize it might sound counter intuitive, but sometimes trying too hard to keep things exciting just makes things more difficult. Occasionally try just giving in to just being present with each note as you play through the scales and noticing all the little subtleties about the music. You might find it’s not that boring. What a good reminder. Many thanks as always. Hey Tomas…I found this video very difficult to follow as it seemed to focus on your strumming hand…I think it would have been more beneficial (to me) to be able to see where u were placing the fingers of your fretting hand. I really enjoy all your lessons and they have helped me immensely. Thank you. Hi Steve, Thanks for letting me know abut this. Just showing the right hand was a mistake. I fixed it last night. I still see one small error in the video (black pause in the beginning) but I’ll leave it “as is” for now. You’ll find the fixed version much better – main focus on the left hand with a small box for the right hand. Let me know when you’ve seen it. Thanks again. Great article, Tomas. Strange as it may sound, I like scales. I’m not good at doing them but I like the challenge of learning them. I haven’t incorporated scales into my practice very much. But after reading this excellent advice and watching the video, learning them will be a regular part of my practice from now on. You are an excellent teacher. Tomas, Just wanted to give you an update. I have learned 7 Segovia major scales and 1 minor scale since the last time I commented and I’m getting good at them. Not as fast as I want to be right now. I practice everyday with a metronome but speed is coming slow for me. Any suggestions? Thanks a lot ! This is a very important lesson for learning music. I wonder what should I do if the key is in Eb major. Should I play key of Eb, or should I play key of C with a Capo? Thanks for the reminder to get back into scales. From watching and listening I also suddenly realised that the tips of my fretting fingers were not landing right onto the frets and so making me have to press much too hard. I had been blaming the “thick strings”, and the guitar, and anything else I could think of. Thank you. I love the way you explain. 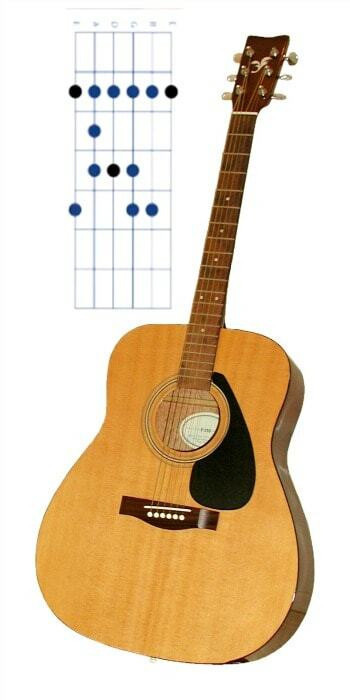 I am a beginner, short and fat hand guy,can play open major and minor chords except B and Bb. I am sure I will learn a lot especially blues and jazz. I love acoustic guitar and love you. Thanks?